DC Sports Guys: Ten Quarterbacks that are better than Eli Manning. Ten Quarterbacks that are better than Eli Manning. In light of the Giants signing Eli Manning to a 6-year, $97.5M contract extension, here are 10 quarterbacks that outplay Eli on a regular basis. 1.) Peyton Manning – Pretty much a no brainer here. The guy is going to break all of Bret Farve’s passing records when its all said and done not to mention he is one of only two Three time MVPs (including last year’s) and a Super Bowl under his belt. I wouldn’t rather have anyone else under center than him. 2.) Tom Brady - Another no brainer. Brady is easily the other guy you want starting for your team to be honest its hard to pick between Brady and Peyton Manning and you can’t go wrong with either one. Brady set the all-time record for touchdown passes in a single season and oh yeah he has won 3 Super Bowls. 3.) 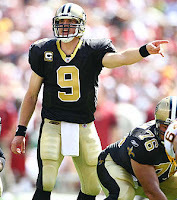 Drew Brees - Is easily a better QB than Eli Manning and his numbers tell the story. With a career passer rating of 89.4 and a completion percentage of 63.9% not to mention that he came within 15 yards of breaking Dan Marino’s single season passing yardage record (something that Eli will never come close to) I honestly don’t see an argument for Eli to even be in the same breathe with him. 4.) 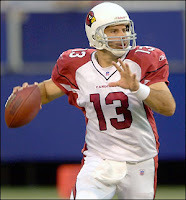 Kurt Warner - With a career QB rating of 93.8 and a 62.4% completion rate which is hands down, far and away better than Eli I don’t think anyone including a Giant’s fan can argue against this pick. 5.) Ben Roethlisberger -Two time Super Bowl Champion with the Pittsburgh Steelers he is better than I would like to admit but its easy for me to say he is better than Eli. Look up the numbers trust me they aren’t even close. 6.) Phillip Rivers - I know they were both taken in the same draft and Eli was taken first overall and has won a Super Bowl (on the backs of his defense and Plax) but Phillip is the better QB and I would rather have him. The numbers don’t lie. He had a career high QB rating last year of 105.5 (which led the league) whereas Eli’s career high of 86.4 (also last year) doesn’t come close. 7.) Tony Romo - This pains me to say that he is good or better than anyone else (he is the starter for my most hated of all sporting franchises the Dallas Cowboys) but to say that I wouldn’t rather have him over Eli would be false. He has thrown for 81 touchdowns versus Eli’s 68. Although I know Tony has choked in the playoffs I wasn’t totally impressed by Eli’s play either. I don’t want to hear about the Super Bowl where he threw up a miracle and David Tyree grabbed what will be his only defining catch in his NFL career. Although I hate to beat a dead horse but in this case it’s Eli, so no biggie, the QB ratings and completion percentages prove out that Romo is a better QB than Eli with Romo completing 63.6% of his passes for his career versus Eli’s 55.9%. 8.) 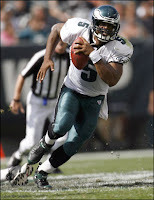 Donovan McNabb - Another QB that I don't like saying anything nice about but he is a better QB than Eli and and a guy that I would rather have playing for me. He adds mobility to position unlike Eli who trips over his own clown like feet. Not to mention the fact that he has taken the Eagles to 4 NFC Championship games including three in a row (2001-03). I know sometimes he isn't the most accurate passer but he is still better than Eli. Which isn't that hard considering his is a measly 55.9%. 9.) 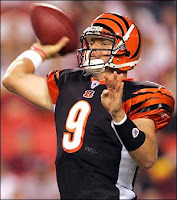 Carson Palmer - I know he hasn't been healthy at all in recent years but despite these injuries I still take him over Eli any day of the week. Carson is the prototypical NFL QB. He has the height, arm strength and accuracy. He never looks rattled (unlike Eli, who at times looks like a lost little boy that found himself all of a sudden on a football field) and when he is healthy he is a top 5 QB. All that being said Giants fans you can't seriously tell me you wouldn't rather have him over Eli. 10.) Aaron Rodgers - Yes I know we haven't had much time to really get a feel for him but he already had a much better statistical year in his first season as a starter than Eli has ever had. 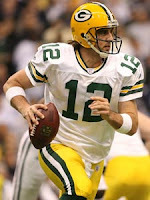 I like the way Aaron makes plays and makes all the throws. Comparing both of their first seasons as starters and its not even close in any meaningful category. Both teams finished 6-10 but there can be no mistake that Aaron is the better of the two QBs. He finished last year with over 4000 yards (something Eli has yet to do), 28tds, only 13 interceptions, a QB rating of 93.8 (Eli has never had a rating above 87), and he averaged 7.5 yards a pass (Eli's best is 6.8).